Your applications aren’t getting any easier and the systems they run on aren’t getting less complicated. Growing businesses mean growing IT infrastructures and increasing complexity. To ensure business service reliability and an excellent customer experience, your application performance management tools must be able to keep pace with the changes, growth and complexity. Is traditional APM – using thresholds and baselines to alert for possible failure – enough or is more needed? 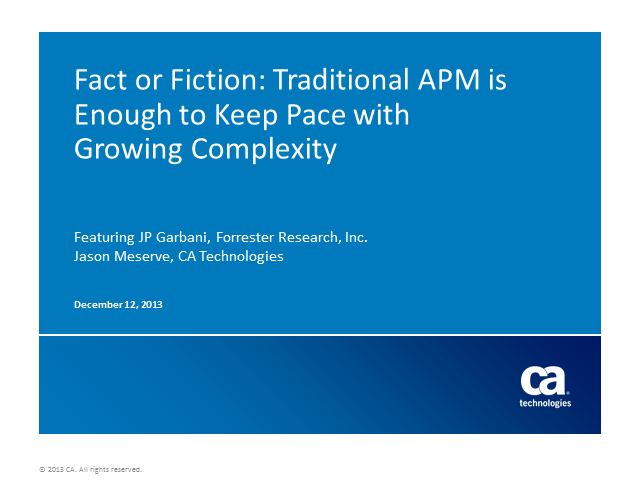 In this Webcast, featured guest J.P. Garbani, vice president and principal analyst at Forrester Research, Inc., examines what is driving complexity, why it’s making ensuring business service performance more difficult and what is required to keep pace now and into the future.